I remember the first time I heard the Hallelujah Chorus from Handel’s Messiah. It was a sound like none other I had ever heard before, the bows of the violinists, violists, and cellists mightily drawn across the strings in gladdest sound; the trumping of the trumpets bright-shining as the sun; and the drums –the great timpani – I could feel them in my chest as they banged away, punctuating the exaltation of the choristers as they sang “Hallelujah, hallelujah, hallelujah – For the Lord God omnipotent reigneth! Lord of Lords and king of kings and He shall reign for ever and ever. Hallelujah, hallelujah, hallelujah” over and over and over. And there, even in Duluth, as those first chords sounded out – buhhm-bu-bum-bump, buhhm-bu-bum-bump, everybody in the audience flew to their feet – in remembrance of the legend of how King George II of England was so swept away by the sound of the Hallelujah Chorus – that he, His Royal Majesty, who never stood for anyone or anything, did on this occasion rise to his feet to honor the Christ being lauded in that grand chorus. This of course meant the rest of the audience was obligated to do likewise, and so ever since wherever in the world it is performed, people rise to their feet in remembrance of the time when an earthly king rose to reverence the Christ who in his resurrection became indeed the “King of Kings and Lord of Lords, and He shall reign for ever and ever.” And I’ll admit it – even when it’s badly performed (which is often) – this Hallelujah Chorus still moves me – and sometimes to tears – tears of awe and wonder and joy and gratitude, and on and on the emotions flow as this hymn to Christ the King is sung. 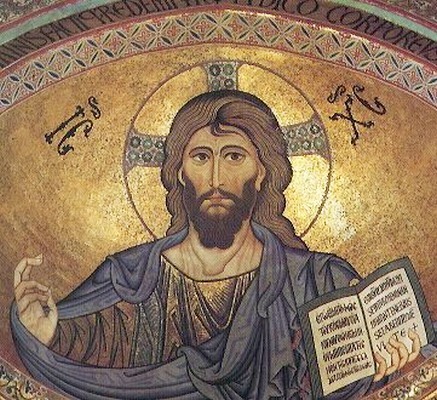 Today we mark the end of the Church Year as we celebrate the Feast of that same Christ the King. Well, perhaps ‘celebrate’ isn’t quite the right word – or maybe what’s not right is the Gospel text assigned for this Feast – the crucifixion test we heard a few moments ago. What a downer, eh? All that crucifixion stuff again. Enough with all of that already. It’s depressing – and who needs depressing? (I certainly don’t need any more of it . . . ) And then we in the Evangelical Lutheran Church in America have that new Presiding Bishop, The Most Reverend Elizabeth Eaton who says about the Church, that all we’ve really got is “Christ and Christ Crucified.” Oh great. Six years of depressing crucifixion until her term ends. Why can’t we have a little less of the downer stuff and a little more of the Halleluiah Chorus? Martin Luther, in his Heidelberg Disputation of 1518, writes about two types of theologians – two types of people who talk about God in Christ Jesus. The first type he calls the ‘theologian of glory’ – this type of theologian takes The Body off the cross, slathers this instrument of torture with the color of precious metal, perhaps studding it with precious (or at least semi-precious) jewels, surrounds it with roses, all in hopes of forgetting the gory bits – ‘let’s get to Easter and stay there because we worship a risen Christ who leaves the blood of the Cross behind so that we can all be happy people’. By contrast, the theologian of the cross – well, obviously, the theologian of the cross is centered upon the cross. The one with the suffering, hanging, tortured body upon it. No precious metals, no diamonds, rubies, emeralds, sapphires, or even cheap glass beads – just the plain cross please – and the body, Christ’s body, and the thorns, and the nails, and the five open wounds and yes, even at Christmas Midnight Mass, and all the Masses of Easter too. In addition, a theologian of the cross, says Luther, “calls a thing what it is,” calls evil ‘evil’, and good, ‘good’. Naturally then, one would expect the theologian of the cross to call this whole crucifixion with the all the blood, the guts, the suffering, the degradation, the taunts of the bystanders – one would expect a theologian of the cross to look upon all these things being done to the One who is God from God – one would expect a theologian of the cross to look upon all these things and call them ‘evil’. But “no, no, no,’ says Luther (with St. Paul at his side, of course), “NO,” the theologian of the cross looks upon all of this and calls it “Good!” along with the Friday on which the deed took place. But how can we call any of this ‘good’ – without sounding like . . . well, like crazy people? Good that Jesus was crucified? Well – no, not in terms of what humanity does here, but at the same time ‘yes’ – ‘yes’ in terms of what God does here. So what does God do here? The theologian of the cross rejects the notion that God-the-Father had to send God-the-Son into the world in order to satisfy God-the-Father’s need for a sacrificial victim to pay the penalty for human sin – a notion that quite frankly makes God-the-Father into some sort of divine child abuser – needing to kill his own son – crazy talk – and how does one unjust death satisfy the Father’s need for divine justice – especially in light of the millions of unjust deaths that span a lifetime? Not, this whole sacrificial victim stuff leave too many holes uncovered. By contrast, the theologian of the cross takes seriously the mystery that Jesus is at once both fully human and fully God – as the Nicene Creed says, “God from God, Light from Light, true God from true God . . . of one Being with the Father” – as our reading from Colossians proclaims concerning Jesus, “He is the image of the invisible God.” So – the one who hangs upon the cross is the fullness of God – of the God who takes on the fullness of the human body – the body that feels cold and heat and hunger and disappointment and love and anxiety and depression – God takes on the human body that eats and eliminates and throws up and gets diaper rash and hemerrhoids too, catches colds and the flu, and that fully feels the excruciating pain of being first whipped half-to-death and then nailed to a crosspiece atop a pole. This fully suffering human IS the fullness of God. But if God – why then not come down from the cross? Why even get stuck there in the first place? Why not, if God, doesn’t This One all of a sudden fly off the cross and zap all of Jesus’ enemies? And OK – if you’re going to go through all that suffering junk, Jesus, why not on rising from the dead, why not then settle the score and do away with all the Christ-killers right on the spot? That sort of getting-even thing would be ‘good’ and all the crucifixion and suffering stuff – well, ‘evil,’ right? And hey, maybe we’ll even dare sing it all some year on a Good Friday. In the Most Holy Name of Jesus. Amen.